This entry was posted in Music and tagged Ambient, Electro, Glitch by bahgheera. Bookmark the permalink. Wow, this is amazing work. 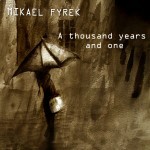 I just got finished watching the first Matrix and then I started listing to Mikael Fyrek and I feel like the world is beautifully turning slow. These melodic songs really captivate your imagination. I love how music can make realize the things around you, and their importance.